[139 Pages Report] The EMEA IoT market is projected to grow from USD 53.88 Billion in 2016 to USD 211.92 Billion by 2021, at a CAGR of 31.5% during the forecast period. The objective of the research study is to provide detailed segmentation of the market on the basis of component, application, and region. It also aims to provide information regarding key factors influencing market growth, and strategically analyze subsegments with respect to individual growth trends, future prospects, and contribution to the total market. The report helps analyze opportunities in the market for stakeholders, provide strategic profiles of key market players to comprehensively analyze core competencies, and draw a competitive landscape of the market. The base year considered for the study is 2015 and the forecast period is from 2016 to 2021. The research methodology used to estimate and forecast the EMEA IoT market begins with obtaining data on key vendor revenues and the market size of individual segments through secondary sources, such as annual reports, press releases, investors’ presentations, white papers, and paid databases, which include Factiva and Bloomberg, among others. Vendor offerings are also taken into consideration to determine market segmentation. 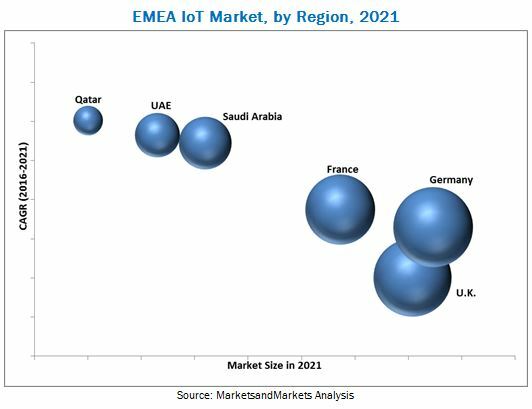 The bottom-up procedure was employed to arrive at the overall size of EMEA IoT market from the revenue of key players (companies) present in the market. The ecosystem of the EMEA IoT market comprises EMEA IoT solutions & service providers as well as system integrators. Key players of the market include IBM Corporation (U.S.), SAP SE (Germany), Microsoft Corporation (U.S.), Amazon Web Services (U.S.), Cisco Systems, Inc. (U.S.), and PTC Inc. (U.S.), among others. The EMEA IoT market is projected to grow from USD 53.88 Billion in 2016 to USD 211.92 Billion by 2021, at a CAGR of 31.5% from 2016 to 2021. The market is projected to grow significantly, owing to the increasing number of smartphone users, rise in smart city projects, and availability of high speed network connections. Major telecom operators in the EMEA region collaborated with global IoT market players to offer IoT solutions and services to their existing client base. Some of the key players in the IoT market include IBM Corporation (U.S.), Microsoft Corporation (U.S.), Cisco Systems, Inc. (U.S.), Amazon Web Services (U.S.), SAP SE (Germany), and General Electric (U.S.). The EMEA IoT market is segmented broadly into component and application. The component segment has been further segmented into platform, software solution, and service. The software solution segment is projected to grow at the highest CAGR during the forecast period. This segment’s growth is mainly due to the increase in deployment of IoT software solutions across organizations to increase productivity and quality of work. Among platforms, the device management platform segment is estimated to grow at the highest CAGR during the forecast period. The rise in adoption of device management platforms across industries is attributed to the increased use of personalized devices, such as smartphones and tablets. Based on application, the smart mobility & transportation segment is projected to lead the market during the forecast period. The rapid growth in population and urbanization is expected to lead to growth of this segment across regions. With increasing population and the resultant increase in vehicles, maintaining smooth traffic flow will be essential, which will create a need for smarter technologies in the transportation domain. In the European region, the IoT market in France is projected to grow at the highest CAGR during the forecast period. This projected growth is driven by the increasing use of mobile phones and social media, and the exponential growth in deployment of high speed networks. In the Middle East & African region, the market in Qatar is projected to grow at the highest CAGR owing to the country’s infrastructure growth, such as in the banking and hospitality sectors, and rise in income levels. Slow economic growth and geopolitical conditions are the major hurdles for growth of the IoT market in Qatar. Key players in this market, such as IBM Corporation, Microsoft Corporation, Cisco Systems, Amazon Web Services, SAP SE, and General Electric, have adopted agreements, collaborations, and partnerships as key strategies to enhance their client base and customer experience. Existing players, such as IBM Corporation, Microsoft Corporation, Cisco Systems, Amazon Web Services, and SAP SE, are constantly innovating and upgrading their products to enhance their market shares. Rising adoption of cloud platforms, development of cheaper and smarter sensors, and evolution of high speed networking technologies are expected to drive the growth of the EMEA IoT market. Industries across the EMEA region are undergoing a huge digital transformation to provide affordable, accessible, and quality services to their customers. 11.10 Amazon Web Services, Inc.